Here’s the thing. This whole no meat thing is difficult. I made it until January 11th when I used chicken stock for my udon noodle soup. I thought I was okay because the recipe called for chicken but I said, “Ha, not so fast. I’ve made it a week without any meat so you’re not going to ruin my streak now.” And then I realized I was talking to the back of a Simply Asian udon noodle box. For some reason I thought that chicken stock was made from chicken flavor, which I guess it technically is but that chicken flavor involves boiling actual chickens. Now that we’ve established how smart I am, let’s discuss how I was assigned two clients last week. Part of the requirement for everyone completing their practicum this semester is to see clients. The students who are getting their master’s in mental health counseling see community members while everyone getting their master’s in school counseling (yours truly) sees undergrad students from the university. I was given two students on academic probation who I have to see for five sessions each, and based on the previous counselor’s notes in their file they are definitely not looking forward to it. This was confirmed by the fact that they’re ignoring my emails and calls. Side note: I have the keys to a file cabinet with all the clients’ files AND the door to the records room. If stuff like this makes me happy I can’t imagine what having a real job will be like. Benefits? Entire summers off? A job that pays more than $9 an hour? I don’t know if I will be able to handle it. A friend of mine and I were also chosen to help lead the intro to counseling class that all the first semester students take. It’s a big responsibility because I’m in charge of the practice group counseling sessions that the new students do. Basically they all take turns being the client and counselor and practice the counseling skills they learned that week, like reflecting meaning or identifying emotions. My job will be to do stuff like pick out what they did well/need to work on and offer suggestions when they stare at me like a deer in headlights because they can’t think of what to say next. The incoming class is pretty small this semester so I’ll only have 3-4 students in my group each week. I somehow have to make that stretch to a 90 minute session, and if these kids (okay let’s be honest they’re probably all older than me) are as anxious as I was the first session it’ll be a rough. I almost passed out the first time I had to recite the limits of confidentiality schpiel (spiel?) all counselors give when they’re with new clients. Luckily I’ve gotten over that. Otherwise I’d be the worst counselor if I just passed out cold while explaining that if I suspect abuse/neglect to a child, elder, or person with a disability I’m required by law to report it. So in order to stretch this first session out I’ve planned things like asking them which non-verbal technique is most important to them and why, what strengths and weaknesses will they bring to the counseling profession, and who their dream dinner guest is. Mine’s Judge Judy. I guess I should briefly talk about the soup. For lack of finding a more descriptive adjective, it’s really, really good, especially for something that took about 15 minutes to throw together. Pretty inexpensive too, which is ideal. I probably spent $10 on the vegetables, stock, and noodles, and it was my lunch & dinner for two days. Like I said, the original recipe called for chicken but in order to make it vegetarian-friendly just leave it out but keep the boiled chicken juice like an idiot. Delicious. Cook udon noodles as directed on package. Drain well and rinse with cold water to prevent them from sticking. While your delicious noodles are cooking, heat oil in a large saucepan. Add the garlic & ginger and cook for about a minute. Add stock, carrots, and soy sauce. Bring to a boil. If you’re doing this while you’re also making the noodles you’re gonna be dealing with two boiling pots, so godspeed. Reduce heat and simmer for 5 minutes. Stir in snow peas and mushrooms. If you’re just using ground ginger throw a dash over the vegetables. Cook an additional 3 minutes. Technically you’re supposed to divide the noodles into 6 bowls and then ladle the soup in, but I just threw the noodles into the same pot because I wasn’t feeding 6 people, although I did eat almost half of it in one sitting. Garnish with green onions if you’re feeling bougie. Ah, January 1st. The day where all of us vow to make drastic changes instead of doing the more logical thing which is to take baby steps towards change. So here I am, deciding to blog again and hoping I can actually stick to it. This year will probably be more interesting than last year so I should have more to talk about. I don’t really have any resolutions per se, but there are a few things I’m happy to have out of my life and even more I’m looking forward to. So here are my lists that I’m typing while watching some show on Netflix about the Arctic circle. Thrilling. Long hair. I’ve spent almost my entire life with long hair, but as I’ve gotten older I’ve cared less and less about actually fixing it, which has done a number on my happiness. I’ve wanted a pixie cut since middle school but whenever I brought it up to people I got comments like “your features aren’t feminine enough” or “you don’t have the right face shape.” Which was hard to hear when you’re 12 and uncomfortable in your own skin as it is. Finally I decided that I was just going for it. The entire salon watched me get it cut and I think my hairdresser was more nervous than I was. She let me cut part of it off, which was surprisingly therapeutic, and I got to donate over 12 inches to Wigs for Kids. This is seriously the most gorgeous I’ve ever felt. I don’t base my self worth off other people’s opinion, but I have gotten a lot of compliments. So I’m not complaining. I don’t know if I’m ever going back to long hair. Also there’s my face. Look how happy I am! I swear I’ve been glowing ever since I got it cut a few days ago. Anger. I’m not naturally an angry person at all and it’s hard for me to stay genuinely mad at anyone long-term. Life is honestly too short to waste energy constantly being mad at people who have wronged you. Whether that’s close friends or some random person who irks you, I think the key is to allow yourself to be upset but don’t let it consume you. I’ve gotten much better at it since getting a seasonal job this fall in retail. I’ve always had jobs in food service or customer service, but jeez, retail is the cream of the crop. I had someone call corporate on me the other day because I wouldn’t let her return hundreds of dollars worth of very obviously stolen clothes. She thanked me for being polite and explaining the return policy to her, but somehow she still accused me of being racist and complained to corporate about my manager and me. And later that day some guy asked for my number and when I said no thanks he ALSO accused me of being racist. Humanity, dude. What’s even going on. My black Converse I bought in 2014 since I can see the ground through them. I really need a new pair of sneakers (preferably Vans since my lower back has been destroyed from 10+ years of no arch support @Converse), but I’ll probably just buy a sensible pair of shoes to wear to internship. Which is the least exciting thing ever. No one ever told me adult life would be this boring. Reading books without finishing them. My Goodreads goal was to read 25 books this year and I ended the year reading 11 books at once. Which is surprisingly stressful. Being out of shape. I haven’t run as much the last few months since I took the fall semester off, but this past summer I was able to run 4 miles without stopping. Luckily I have a friend back up at school who was dragging me to the gym every day to lift weights, so getting back in shape is definitely attainable. Internship in the spring & fall. In two weeks I start my internship at a middle school. I’ll be working alongside a counselor at a school with over a thousand 7th and 8th graders. I’m terrified and excited, and I definitely have some impostor syndrome flaring up. Everyone from my professors at school to my favorite piercer at my tattoo parlor thinks I’ll be a great counselor, which is comforting. I think being naturally empathetic is a gift that shouldn’t go to waste, so I’m hoping to make the best of it. The rest of my internship will be in the fall and right now I’m planning on doing it long distance somewhere in my home state. Graduation. I’m done in December. Thank god. Working towards getting a second master’s/Psy.D. My school is giving me the option to come back to get a master’s in clinical mental health if I want. Right now I’m getting it in school counseling, but I can spend another year to take a few more classes and do a mental health counseling internship and have two master’s degrees. I’m debating either taking that route or just going ahead and getting my Psy.D in child & adolescent psychology or developmental psychology. There’s not enough time or money in the world for me to accomplish everything I’m interested in which is dumb. Is there a way to be a school counselor by day, a substance abuse counselor by night, and then maybe do some geriatric end of life counseling on the weekends? Doing homework at Starbucks again. At the Starbucks across the street from campus the baristas start my venti passion tango tea with light ice right as I walk in. I don’t know if that’s a good or bad thing. Spending more time with friends. My roommate this past summer has become one of my best friends and she said she’ll have homemade mashed potatoes waiting for me when I fly back in a few days. What did I do to deserve this. I’m really thankful to have formed some fantastic friendships the last few months, but friendship is a two-way street so I need to continue to put effort into them. Because friends do things like make delicious mashed potatoes for you. Cutting back on meat. I don’t know if I can go fully vegetarian right away, but I’d like to cut back on at least red meat. My goal is pescetarian in the next few months. Because why not? Also I mostly only eat PB&J and quesadillas up at school anyway to save money. I live a various glamorous life. Cross stitching. It’s one of my favorite ways to wind-down and I left all my thread back at school, so I’ve been in withdrawal for months. There’s a craft store right up the street which I guess is a testament to how lazy I am sometimes. Blogging. I’ll do what I can. Oh and this show has confirmed my suspicions that I never, ever want to live anywhere near the Arctic circle. I think by now you all know about my intense dislike for my psychology teacher. Everyone in the class is burnt out by her. She won’t admit that she doesn’t know the answer to a question we ask her that was on a quiz, she’s yelled at us more than once, and she has a fake smile constantly plastered on her face that we know means “I’m psychoanalyzing all of you.” I love the class itself and I’ve learned a lot, but I’m ready for it to be over. “I’m so handsome,” said George. “Oh darling, you are. The way your creepy lazy eye constantly stares off into the distance makes me fall in love with you even more.” Samantha sighed. One of George’s eyes always looked at Samantha. “Run away with me, darling,” he said. George looked sad. He may be a hottie with a body, but he was stupid as all get out. I didn’t realize that these stories had to be serious because after we wrote them we had to pass them around. The professor whom we all fondly refer to as Karen even though she’s demanded we call her Professor [insert last name that I never use and sometimes forget] had some people read theirs out loud. Whoops. Luckily everyone approved of my story so my snarky remarks didn’t get me in trouble this time. But if you hear shouts of pure joy at 9:20 tomorrow morning it’s all the nursing student in the class celebrating that all our classes are finally over. On to finals and then home for a month. I just wanted to let everyone know I made it back to school okay. It was a pretty uneventful trip. Lots of cows and boring, flat farm land. I drove with two of my friends from my hall so it wasn’t horrible. Oh hey, speaking of horrible, guess what I got to come back to? Apparently I accidentally left my room set at 80 degrees over break. 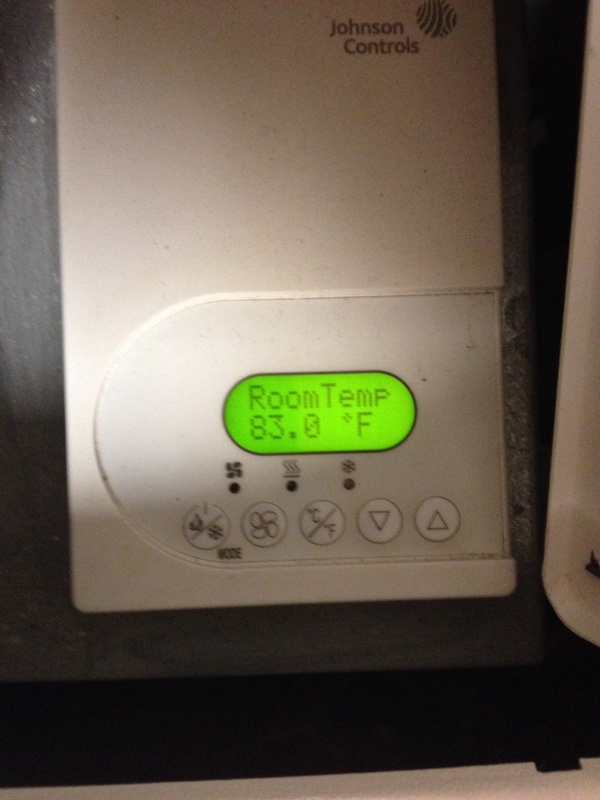 I walked in my room to find it a balmy 97 degrees. I’ve had the windows open and the fan running for an hour and it’s cooled down to 83. 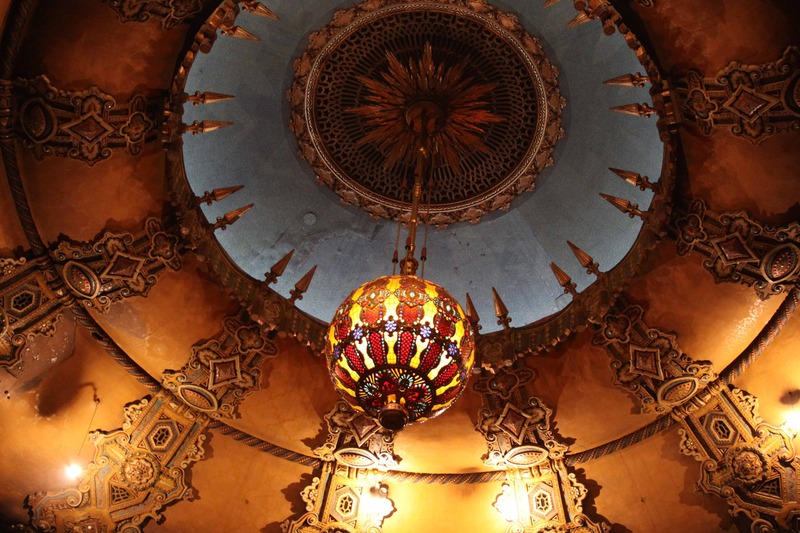 When visiting the Fox Theater, try not to get squashed by falling elephants. The only problem (?) with my mom having another kid is that people keep bringing us meals. Delicious meals that I don’t have to make, which are really the best kind. Tonight’s was especially delicious and I hope I – as a food blogger – didn’t intimidate you too much, Mrs. W. We all enjoyed dinner tremendously. That being said, because we keep getting meals, I can’t make anything for my blog because we really have no room in our fridge for any more food. That might be because we have the smallest fridge on the planet that’s a billion years old and totally falling apart. There’s also no ice maker in it and my siblings enjoy leaving one ice cube in each ice cube tray and then putting them back in the freezer. Don’t even get me started. 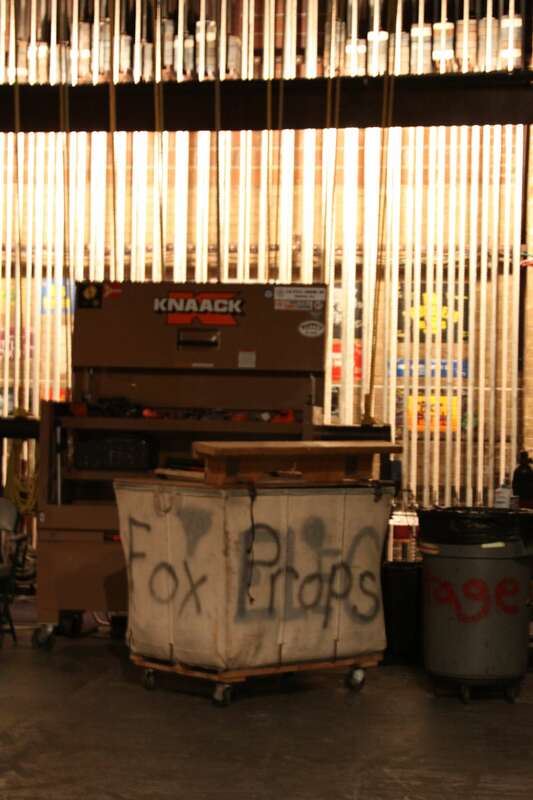 The other day I got to go on a tour of the Fox Theater. For those of you who aren’t cool enough to live in St. Louis like I am, well, I’ll pray for you. Especially if you’re from Chicago. Does anyone know why St. Louisians and Chicagoans fight? Yeah, me neither. All I know is we always win. Especially when it comes to being in the NLCS this year. Too soon? 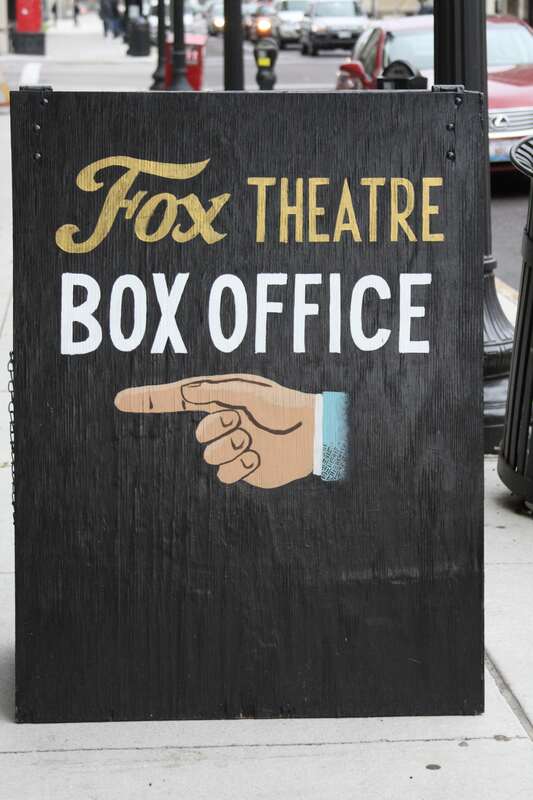 Back to the Fox. 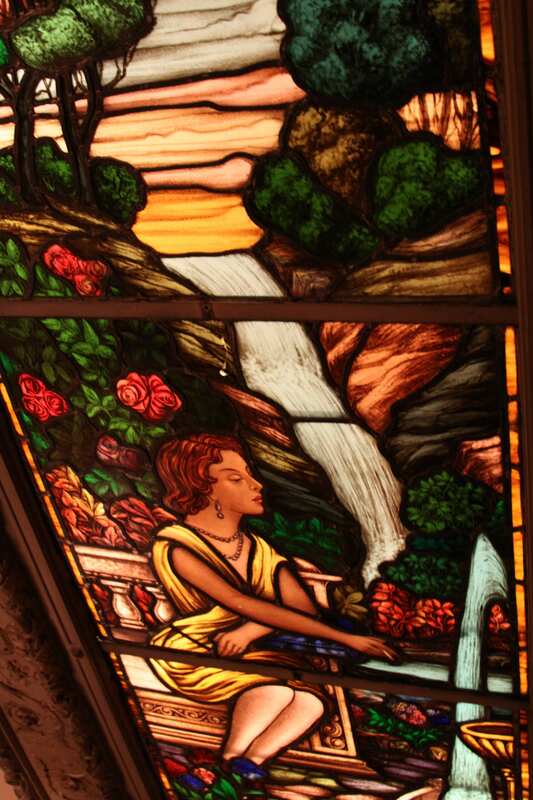 In my humble opinion, it is one of the most amazing parts of St. Louis. 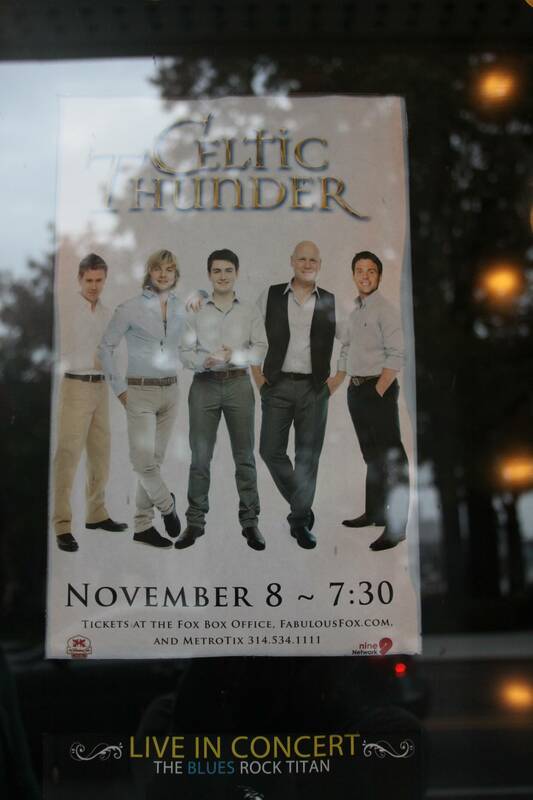 I’ve been to a bunch of shows there, like Wicked, Jesus Christ Superstar, and Celtic Thunder (my friend and I were scared we were going to get kicked out of that one…oops? Team Damian McGinty. ), but really haven’t seen much of it. The shows I usually go to are late at night and you can’t really stick around afterwards to look at stuff when it’s dark and 5,059 other people are trying to leave the theater. 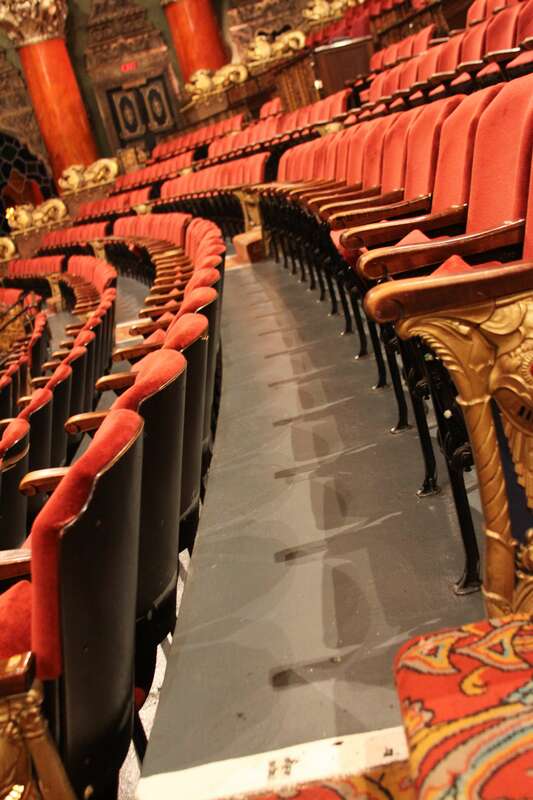 Last weekend I was able to go on a tour of the entire theater. 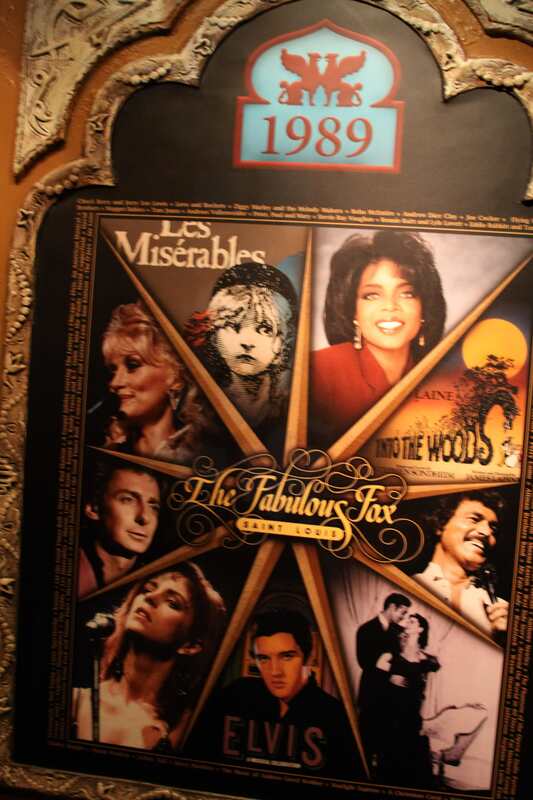 The tour guide said that that day was one of only 60-65 days a year when there weren’t any shows that night, so we could go backstage. You’re jealous already. But wait, it gets better. Right when you walk into the Fox you’re kind of overwhelmed with how huge the lobby is. Well, at least I was. 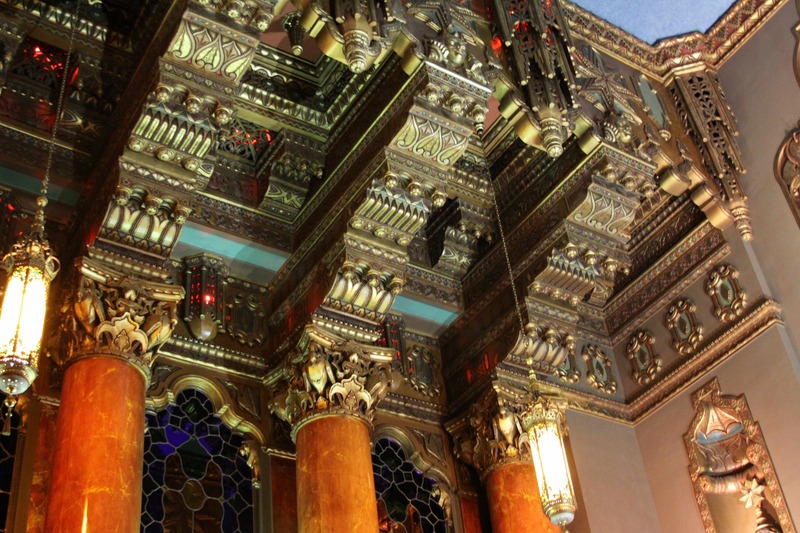 The whole theater is very elegant and dark and mysterious. 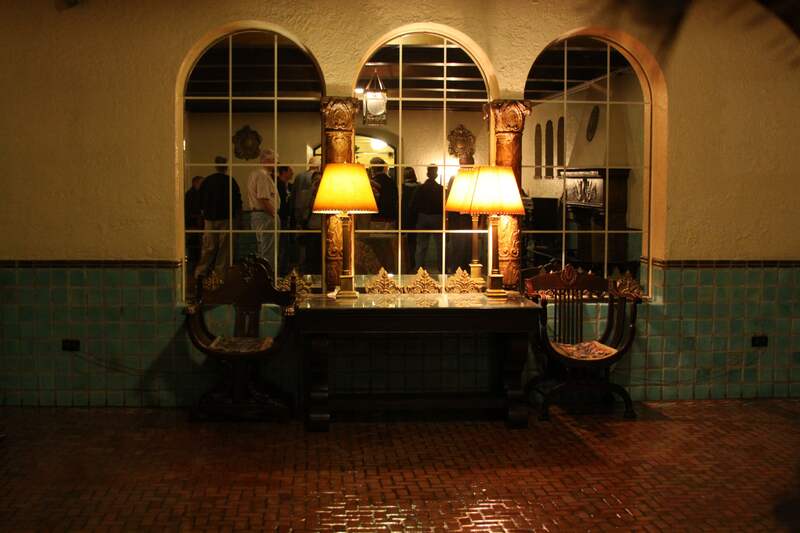 The elegant part was nice, but the dark and mysterious didn’t make for such great pictures. And I hate using a flash. True story. 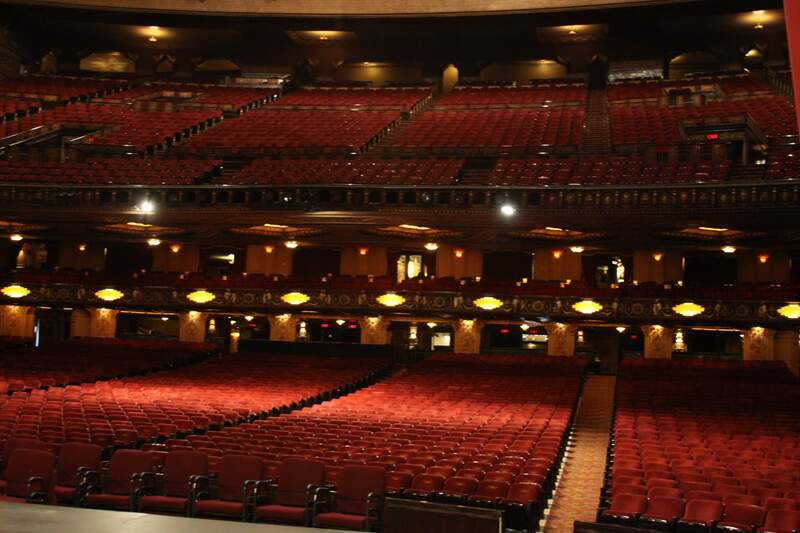 After leaving the lobby, we went to the auditorium. It was really nice to sit in the first row because the closest I’ve ever been to the stage is 6 rows from it. But that was when I saw High School Musical, so it totally doesn’t count. 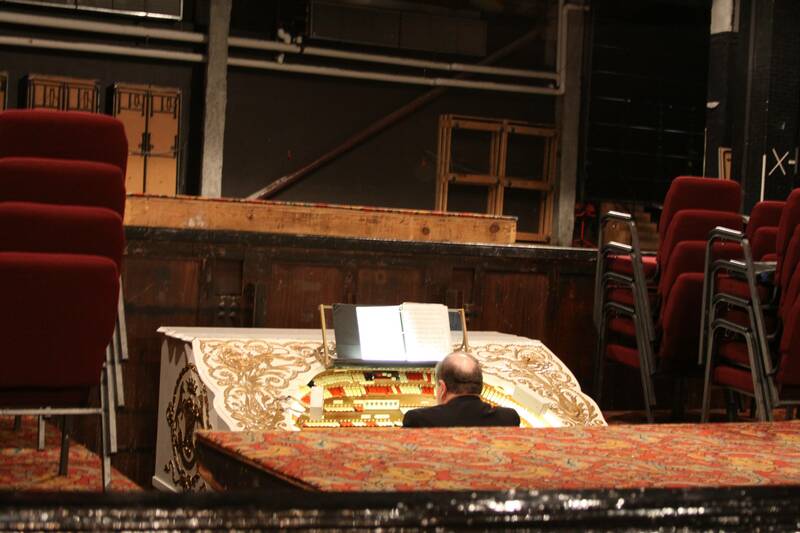 Not only is there an organ in front of the stage that’s been there since the theater opened in 1929, but it rises from the ground. 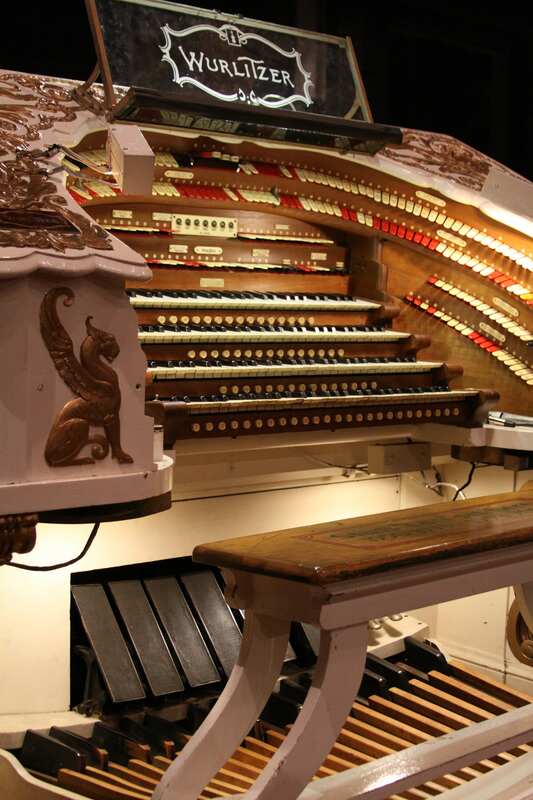 It made me want to start up organ lessons again. Kinda. The man who played it for us said that if he plays the notes with the biggest pipes, the foundation of the theater shakes. I had to restrain myself from pushing him off the bench and finding the foundation-shaking pipes, because how cool would that be? The pipes, not me pushing someone off a bench. Well, maybe. There’s a chandelier above the orchestra section that I’m seriously scared is going to fall on me every time I sit beneath it. Turns out if it does fall, I’d be quite flat. The chandelier is 12 feet in diameter and weights 5000 pounds. It also takes 30 minutes to lower it. Kind of like the ball in Times Square on New Year’s Eve…except I can safely watch that on my tv and I don’t have to multitask watching the guys from Celtic Thunder do spins in kilts and keeping an eye on the chandelier so I don’t die. After leaving the auditorium, we went on a tour of the rest of the theater. We rode in an old elevator (I’m going to say it’s called a crank elevator…? All I know is that the tour guide raised it up manually. And there was a creepy dude standing awfully close to me the entire time. ), went into the men’s and women’s lounge, and saw the box seats. 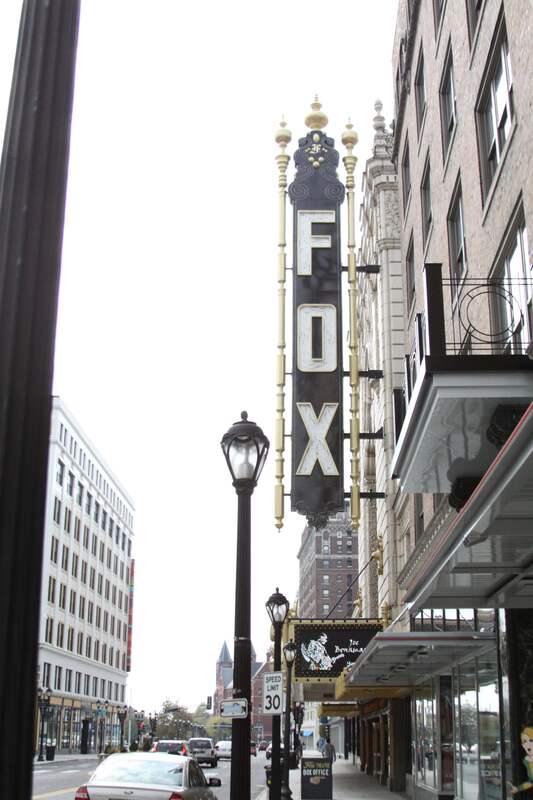 Dear Fox Theater, are you listening to how nicely I am talking about your theater? May I please have box seats? 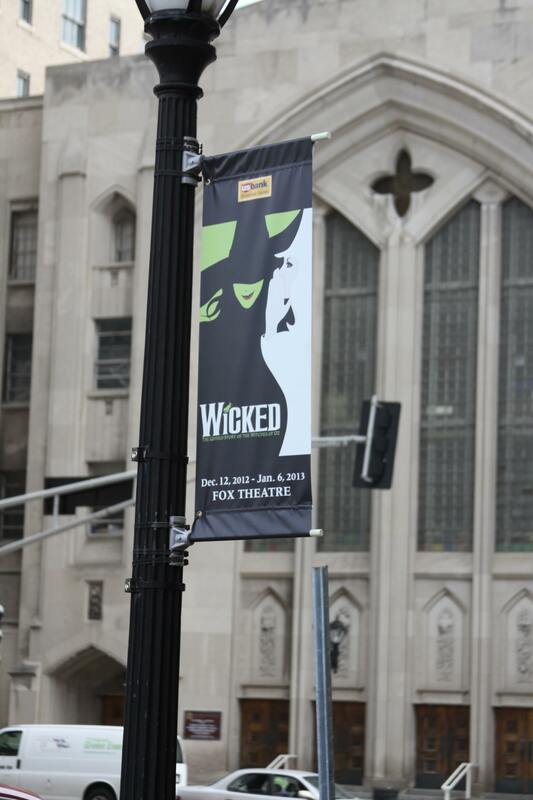 Or at least a free ticket to see Wicked this December? Yes? Fantastic. There are elephants throughout the entire theater. An elephant with a raised trunk is a sign of good luck. 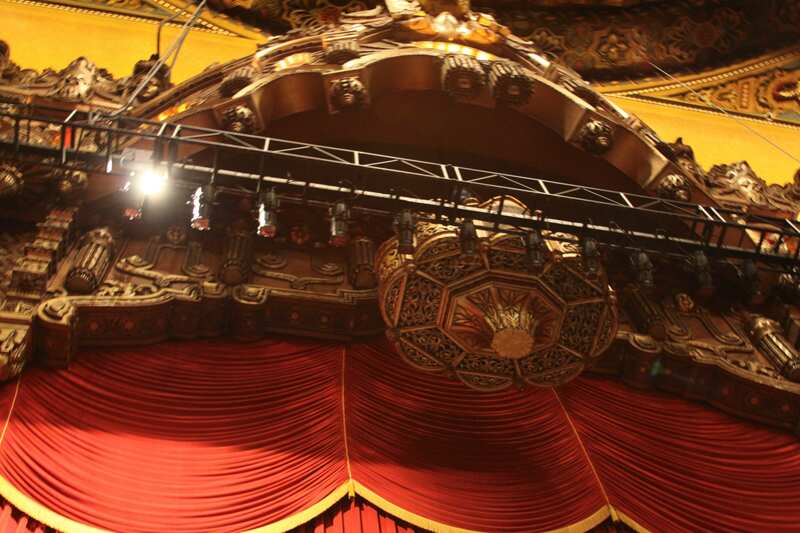 Hence this super scary elephant right above the stage. Wouldn’t it be ironic if that elephant fell on someone? Hey, just saying. 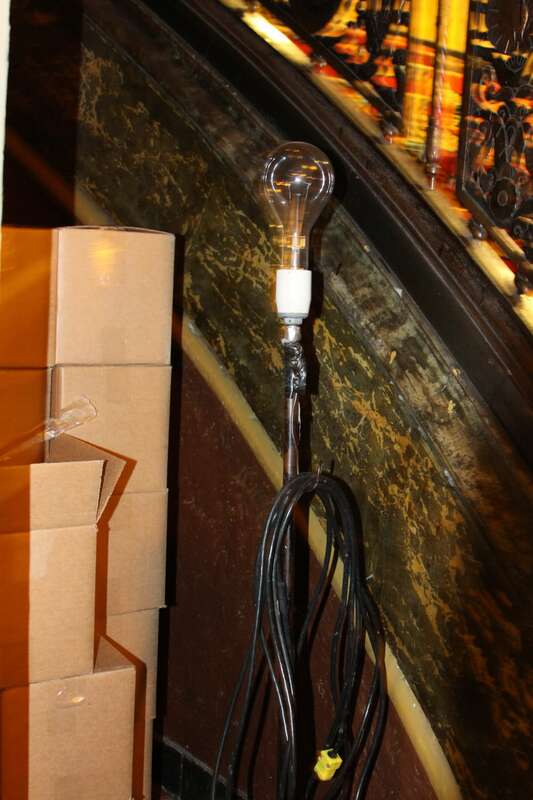 This is a ghost lamp. I know what you’re thinking. You’re thinking, “Wow, I could seriously go for some waffles right now.” Oh wait, that’s me. You’re thinking, “That’s ugly.” We both have slightly strange thoughts. That must be why we’re such good friends. But yes, it’s hideous. Want to know what it’s used for? They turn on the ghost lamp after every show and leave it on until the beginning of the next one so the ghosts in the theater don’t run into each other. 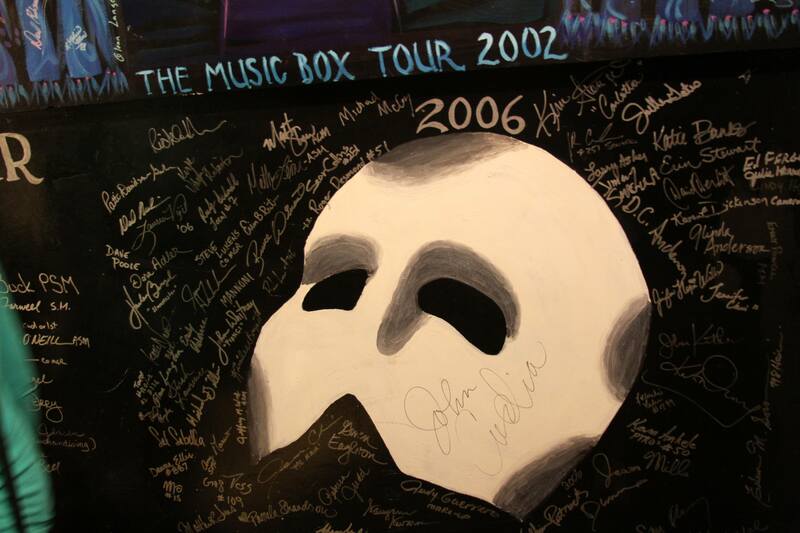 Now the theater’s haunted. Luckily I’ve watched one too many episodes of Ghost Adventures because I knew that if I ran into a ghost, taunting them would only make them follow me home and haunt me forever. Thank you, Zak Bagans. See look, more elephants. 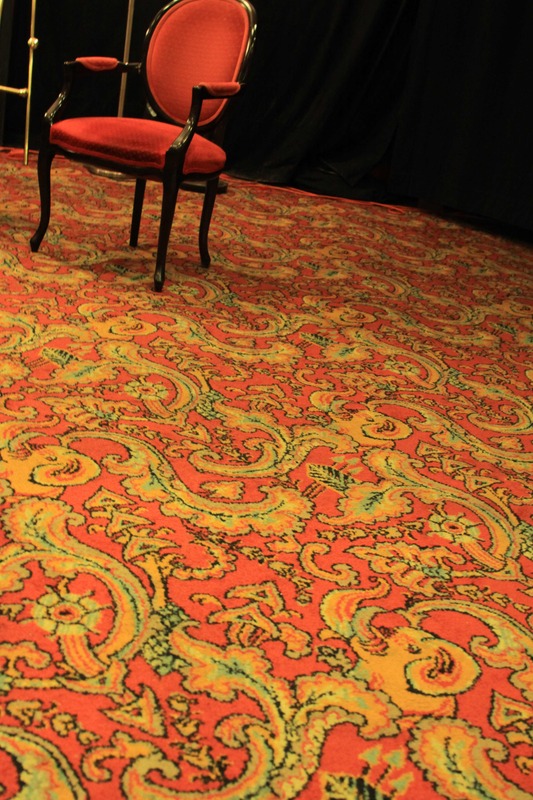 These are on the carpet in the audition room. 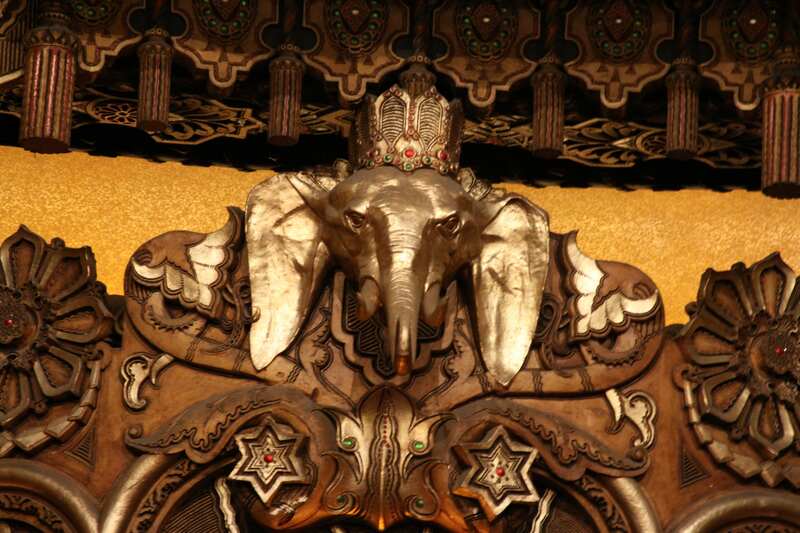 All of the elephants in the theater have their trunks pointing towards the stage. It’s really cool, actually. And these are props in front of a bunch of scary electrical wires. Does anyone else ever have that feeling when they’re up really high on a balcony or staircase that they’re going to throw themselves over the edge for no reason? I kind of felt that way about the wires. I was like oh my gosh, it’s going to be like that scene from the Psych episode Tuesday the 17th when the guy pushes the other guy into the wires and he gets electrocuted. This and waffles are pretty much the only things I think about. And ironic falling elephants. This was on the stage. The picture’s a bit blurry, but I had to take a picture of it because there was a old man next to me who said, “They didn’t put a date on it. How the heck are you supposed to know when next week is? Crazies…” We’re best friends now. 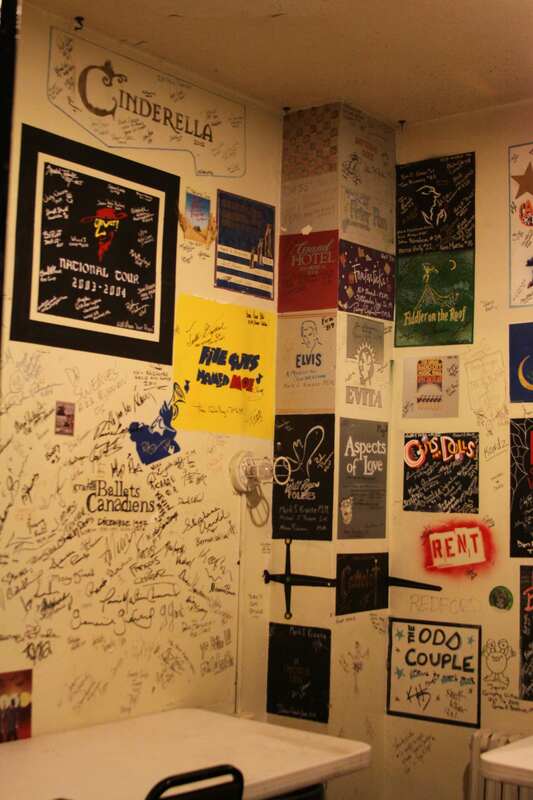 The walls leading from the stage to the dressing rooms are covered with signatures of people from every show since the theater reopened over 30 years ago. How cool is that? 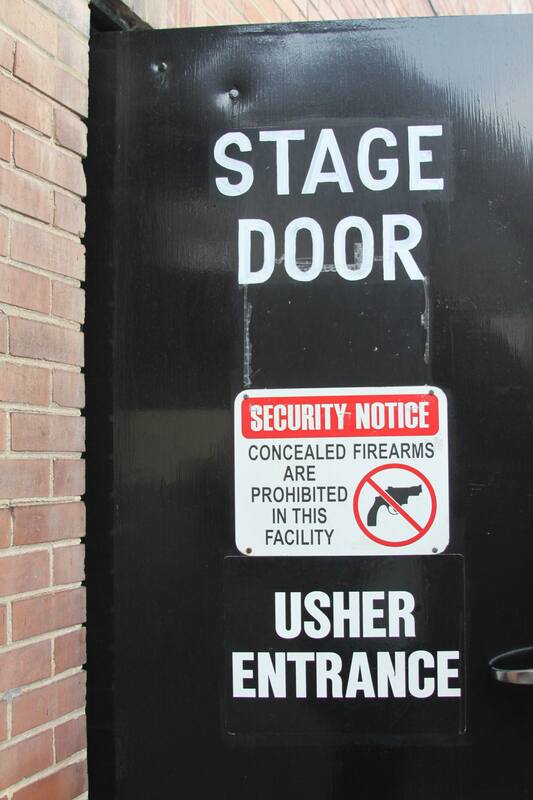 I unfortunately didn’t get any pictures of the dressing rooms because I didn’t want people in any of my shots. No seriously. A majority of the people there were wearing ratty jeans and tee shirts, and I didn’t want them ruining a perfectly good photo. I know, I have issues. But I can describe the rooms to you. If you’re a star, you get a super fancy dressing room with couches and a tv. If you’re a schmuck, you get stuck in a small room with 24 other people, and the walls and floors are an incredibly depressing shade of white. It’s so small there’s no way the fire marshal would allow the maximum occupancy to be more than 2 oompa loompas, a fig newton, and an ant. Moral of the story? 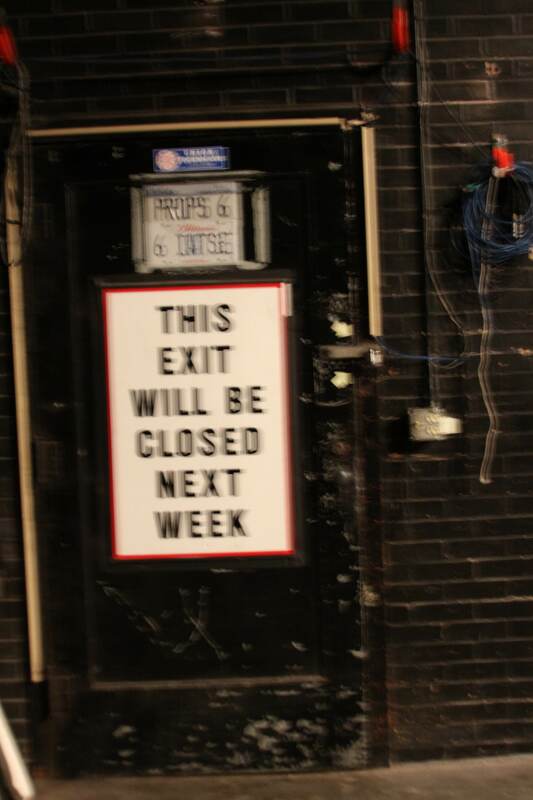 Unless you want to develop claustrophobia, don’t go into acting. 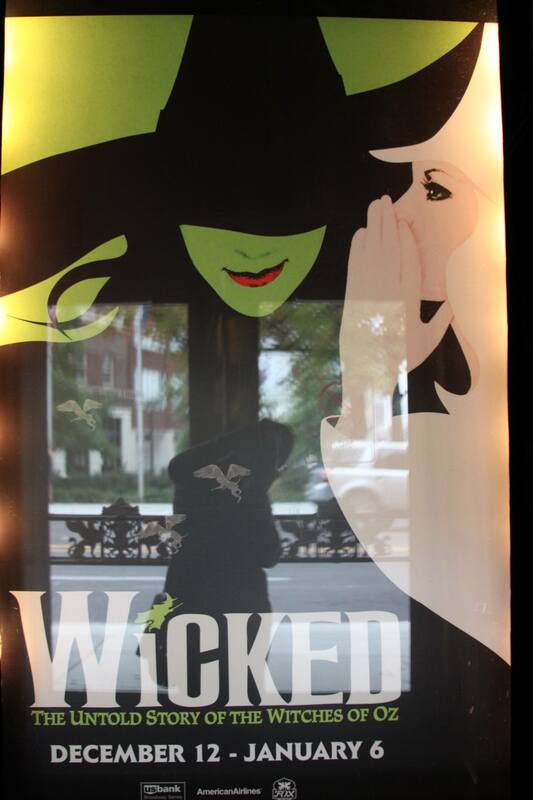 I’m not obsessed with Wicked. 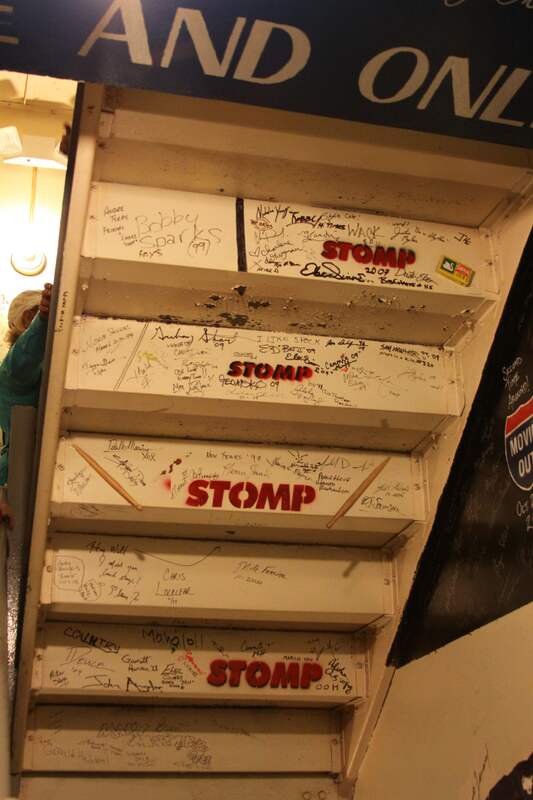 Going on the tour made me really want to be on Broadway. Unfortunately that would require me being able to sing, dance and/or act. I really don’t see that happening since I don’t sing much, I was told by my ballet teacher that I wasn’t a ballerina (I was like well, on that note, I quit. You big meanie. ), and the last play I acted in was when I was in 5th grade. I played elf #2 in The Lion, The Witch, and The Wardrobe. I had three whole lines. So basically I’ll never be on Broadway. Oh well. 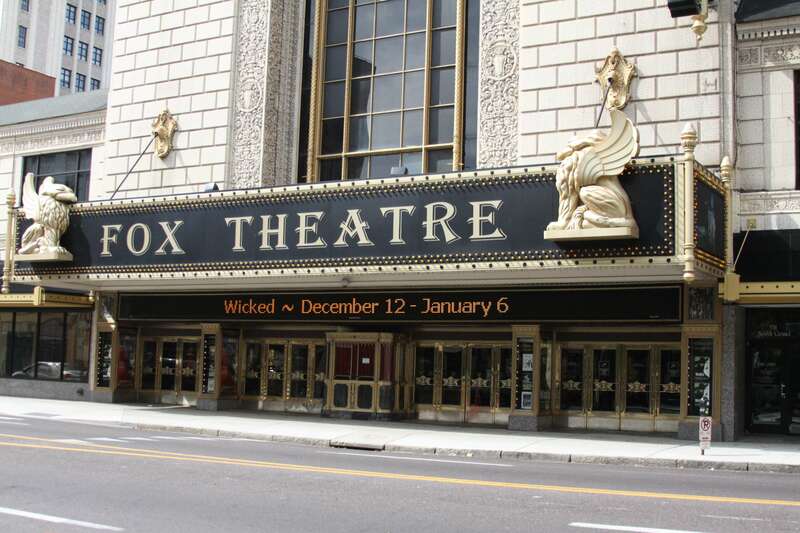 I’ll just go see Wicked later this year with the free tickets I’m getting from the Fox. Right? Oh and Beth, this is for you. AND my blog got its 35,000th page view today. I love you guys.